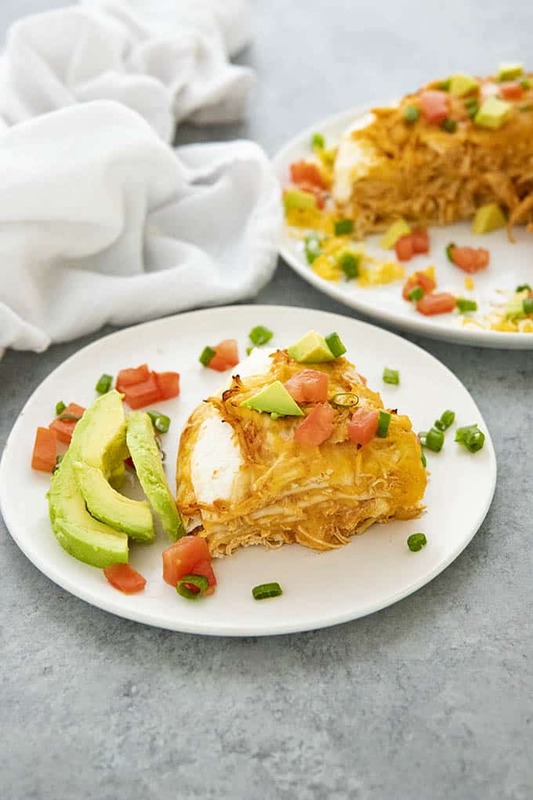 Chicken Enchilada Pie has all of the flavors of enchiladas without all the rolling! Full of shredded chicken, enchilada sauce, sour cream, and cheese! 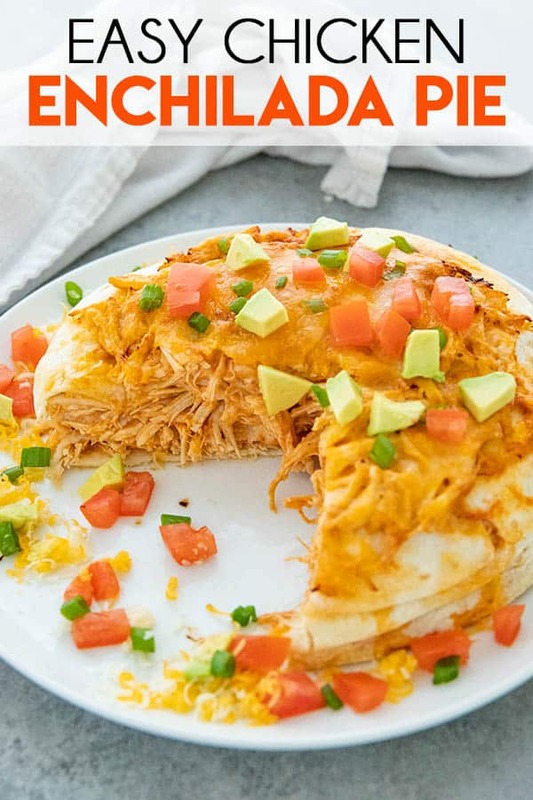 Since I finally gave you guys the Instant Pot Shredded Chicken you’d been asking for, the obvious next thing was a fun new recipe to use it with! 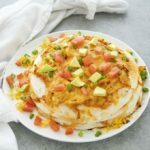 This enchilada stack is so good, and comes together super fast. We loved the savory flavor so much, and could hardly stop eating it! Talk about carbs at lunch over load, the struggle was real, but worth it! My enchilada pie is oven baked. And, because I know a few of you will ask about making this in the Instant Pot, I am happy to advise that it turns out much better in the oven. There’s a rhyme and a reason for the things we do here! First things first, preheat your oven as directed in the recipe card. Grease a 9 inch springform pan and set aside. Mix together your cooked shredded chicken in a large bowl along with the enchilada sauce and sour cream. Grab a second bowl and mix together both of the shredded cheeses. 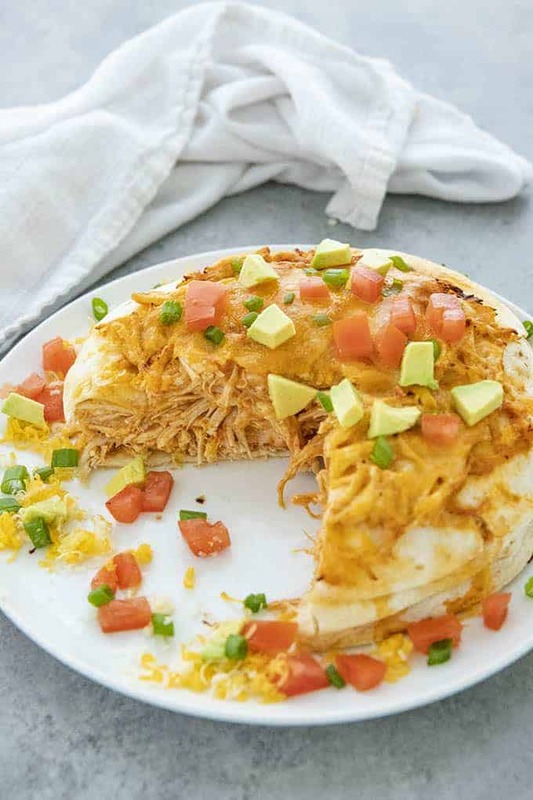 Layer one tortilla in the bottom of the prepared pan and top with some of the chicken mixture, and some of the shredded cheese. Repeat the layers four more times, ending with cheese. Bake in preheated oven for 20-25 minutes until heated through. Serve with extra sour cream, chopped onions, tomatoes, black olives, and any other toppings you love! Preheat oven to 375 degrees. Grease a 9 inch springform pan with non-stick cooking spray. In a large bowl, mix together the shredded chicken, enchilada sauce, and sour cream. In a second medium bowl, mix together the shredded cheeses. 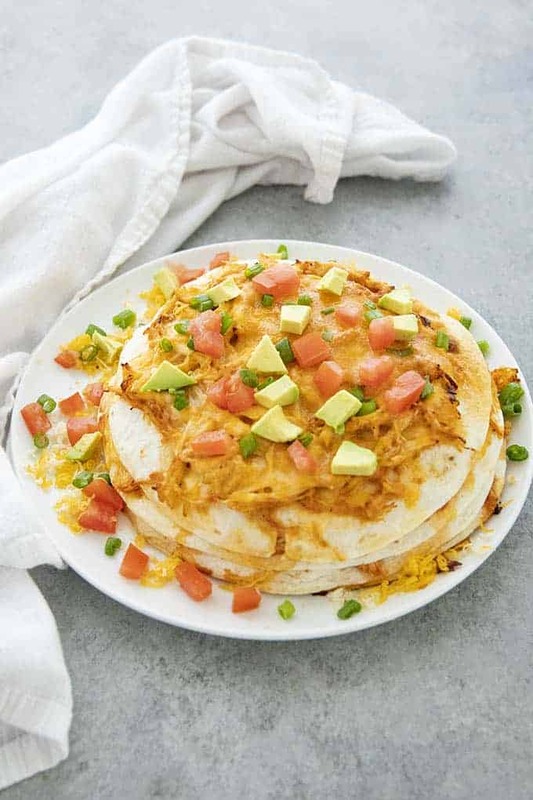 Place one tortilla in the bottom of the prepared pan and top with a layer of the chicken mixture followed by some of the shredded cheese. Bake in preheated oven for 20-25 minutes until hot and bubbly. Garnish with toppings as desired.